Open Trials for 2019/20 Angels Academy. 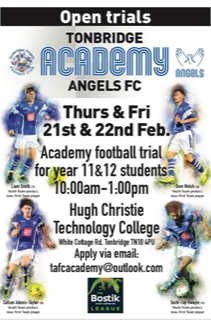 Open Trials for this year's Tonbridge Angels FC Academy intake are to happen at Hugh Christie School, White Cottage Rd., Tonbridge, TN10 4PU on Thursday and Friday February 21st and 22nd from 10:00am to 1:00pm. There will be training sessions together with small/larger sided matches so that students can showcase their abilities. We will then commence the process of selection for places in the new Academy year starting this September.